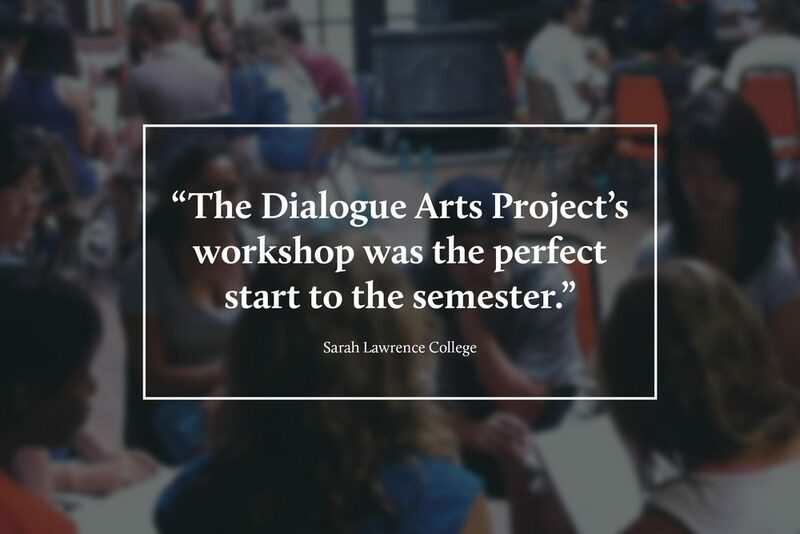 The Dialogue Arts Project (DAP) is an innovative arts-based consulting group that is reimagining the current "diversity training" experience. DAP partners with communities to create energizing training experiences in order to help participants collaborate & communicate more effectively across lines of social identity and difference. By combining performance, participant art creation, interactive exercises and facilitated dialogue, DAP curates workshops that increase awareness of self and social diversity for a wide array of clients ranging from university faculty, teachers-in-training, student leadership groups, and employees of Fortune 500 companies and non-profit organizations. 93% of 400 Young Adults over a 4-year per. 92% of 400 Young Adults over a 4-year per. 89% of 400 Young Adults over a 4-year per. In an increasingly pluralistic society, the need for self-awareness, tolerance and open communication has never been more critical. Despite this, the field of diversity education has struggled to meaningfully respond to that challenge and educators & organizers have grown weary of professional development sessions that seem to merely “fill a quota” in addressing critical issues of race & social identity in the classroom. Utilizing the arts to create a shared entry point into dialogue, DAP prioritizes the diverse range of identities contained within individuals and explores how personal experience can be shaped by the interplay between those identities. DAP workshops are multi-day or week-long engagements, containing 4 unique stages that are designed to be incorporated into conferences, trainings, or festivals. Specific engagements can be as long as eight weeks and as brief a single day, depending on the needs and scheduling restrictions of partnering organizations. Shorter engagements of 1-2 days provide an introductory experience to the DAP philosophy and model, whereas longer commitments of several weeks or more are designed to produce more targeted and sustainable impact within the culture of a partnering organization. During this episode, Zucker speaks with Adam Falkner, Lauren Whitehead and Carlos Andrés Gómez about how working with DAP has affected their creative work, their teaching, their lives and their priorities. They talk about how a workshop model can be used in schools, offices, and organizations to reimagine and revitalize diversity education, the power of performance and first-person narratives, guidelines for encouraging openness and risk taking, how to invite vulnerability into the classroom in responsible ways, culture-based intentionality, the permission to start with the self, how and why to step out onto the vulnerable edge in order to dismantle the master’s house, coming out, seasonal personal and political grief, and visions for expanding the DAP’s reach. DAP founder, Adam Falkner, sits with poets Aziza Barnes, Jose Olivarez and Jon Sands -- known to the vast podcast nation as The Poetry Gods! -- to talk education, popular culture, and DAP's commitment to "writing into silences" as a central pillar of it's pedagogy. Listen to the full episode here! The following essay is by Kari Henry, a 10th grade student at the Academy for Young Writers who participated in the Dialogue Arts Project’s first-ever 36-week elective for high school students. Composed as the introduction for We’re All Quite Mad Here, a class anthology that served as the culminating project for the 2012-2013 school year, Kari talks about her own writing as well as the writing of her classmates, the experience of engaging with her peers in dialogue around difficult subject matter, and how the DAP elective impacted her ability to “take risks” as a writer.